In the past, SEO success was measured by rankings of target keywords; then the focus moved to traffic; today we have moved into the bottom-line era: organic traffic should be measured by its impact on revenue. This post is based on a presentation delivered at eMetrics San Jose 2009. It is about ways to integrate and improve SEO and website usability (using web analytics) and create a synergy that will improve the conversion rates of websites. Measuring SEO success using rankings is out-of-date: rankings fluctuate significantly and do not show any improvement on the website success. Traffic does not fluctuate so much, but it still does not show you the money. The way to measure SEO is by measuring its ROI. 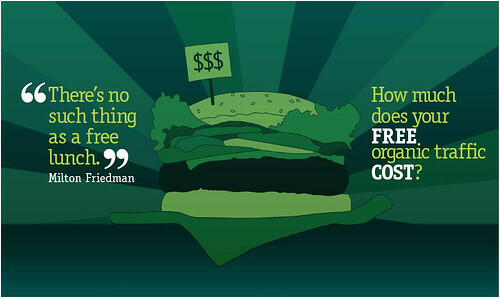 Many people still think of organic traffic as free traffic. Although it is possible to get free organic traffic, to go to the next level and attract the masses to any website, it is highly important to invest resources, either with an agency or in-house people. Besides, many changes to the website are needed. Therefore, it is very important to consider all the expenditure with SEO, be it with consultancy, in-house development, or other. This way, it is possible to get to the understanding of the SEO ROI: how much profit you are getting from your organic traffic? As we all heard time and again: when it comes to SEO, content is king. We don’t disagree. Relevant content is really essential in any website, both for SEO and for conversions. However, there is a clear tradeoff between content and usability (the design). Sometimes people are so worried about one of these elements that they completely forget about the other one. 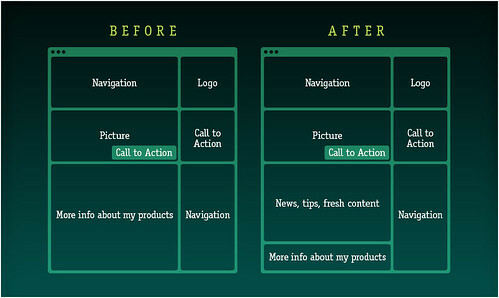 The image below represents all the content (above the fold) before/after a change made for SEO purposes. The only change was the addition of fresh content above the product info, which pushed all product info to below the fold. Including more content on the page should not hurt the conversions of the website. However, the product pages have a very high conversion rate, and we saw a significant decrease in the visits on product pages. Conclusion: we saw an increase in the organic traffic, but a decrease in the overall conversion rates of the website. 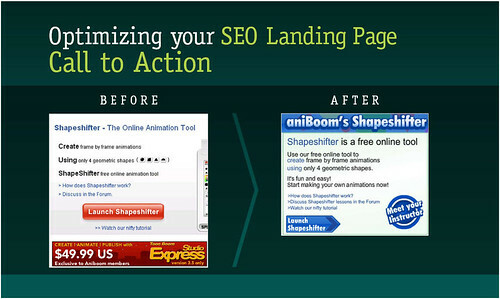 When we talk about paid search campaigns, it is very natural to talk about landing page optimization. However, this is not so obvious when talking about organic SEO campaigns. But the importance is the same; both should be highly efficient in converting incoming traffic. The first question we should ask is: “Should I create or use an existing page for a keyword I am targeting with SEO?” And the answer: It depends! Depends whether your site already has relevant content for this keyword or not. If you have a juice website, and you want to rank first for “soft drinks” it is not very efficient to use your homepage or another juice page for the keyword “soft drinks.” Even if you do succeed to rank first for this keyword you will probably have 100% bounce rate. But if you create a special page in which you show a comparison of different types of juices and soft drinks, it might persuade people to read further. A useful tool to test the success of SEO landing pages before you target them is AdWords. You can create a campaign in which you send visitors coming from “soft drinks” to different pages and decide on the best SEO landing page. 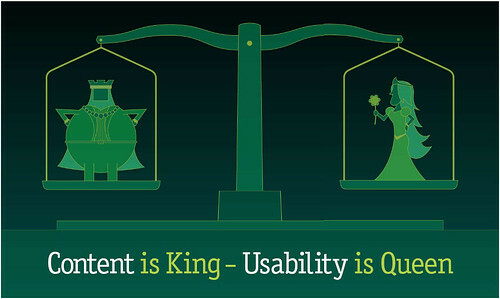 If content is the king and usability is the queen, relevance is the prince! Another important element to optimize is the snippet that appears on the search results page: this is the first interaction of the user with your website, and ultimately may determine the click through rate from visitors coming from search engines. The snippet is what you promise to your user; are you delivering it in the landing page? You should be. It is very common nowadays to optimize SEO by measuring the success of keywords bringing traffic to the website. While this is great, by doing that we lose a precious source of keywords: the keywords your customers are typing in your website, i.e. your internal site search. This is what they are really looking for, and you should check if you are targeting those keywords. Here is an example of a way to analyze internal search and optimize your SEO efforts using it. TED is a very interesting conference that makes some of their talks available on their website (we did not analyze TED website, but did the same analysis for several websites). In the table below you can see on the left-most column search terms used by the visitors in the website (which keywords were typed in the internal search box). 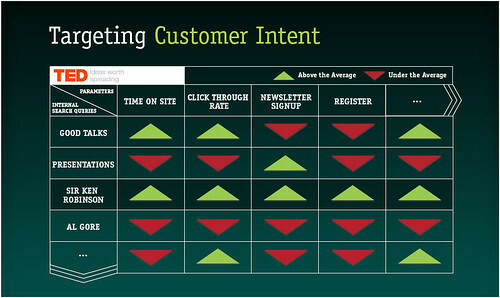 Each additional column represents a KPI for this term: how long users stayed on the website after searching, how many users clicked on a result from this search, newsletter signup (conversion), and registration (conversion). For each KPI, you can see if the keyword ranked above or below the average. So, for example, people that searched for “good talks” in the website stayed longer than the average searcher in the website, they clicked more often than the average on the results, but they converted less than the average for both conversion types. Sir Ken Robinson was above the average for all KPIs. TED always has some kind of cloud tags in its homepage, either with text links or image links. The way they usually organize the homepage is by recency of the talks, meaning that the latest talks get the better spot. Although this might be a good way to organize the website, we think a different way could be to organize it by highest converting search terms. So for example, it might be that every single person that gets to Bill Gates talk (which was the latest talk when this article was written) leaves the website. So why should it be the first one, just because it is the most recent one? Based on internal site search we can find the most converting terms and include them in the homepage: this would improve the usability of the website, meaning that people would find what they are looking for on the homepage, and it would improve the ranking for this specific term on search engines. These high-converting keywords should certainly be part of your target SEO keywords. In summary, it is essential to adopt a customer centricity approach to web analytics. Rankings and traffic are not good measures of success for SEO efforts; we should focus on conversions and be sure to calculate the ROI of our organic traffic as we do for all other medium. A few takeaways: keep in mind the tradeoff between including content in the website and keeping it focused on conversions; choose carefully and optimize SEO landing pages; use your internal search to expand your keyword targeting on search engines and to give customers what they are looking for. View more presentations from Daniel Waisberg. Daniel Waisberg is the Principal og Conversion Journeyand the founder of Online Behavior, a Marketing Measurement & Optimization website. He holds a M.Sc. in Operations Research and Decisions from Tel Aviv University, where he developed a statistical model that helps to optimize websites using Markov Chains. Daniel is a frequent speaker & member of the Advisory Council of the eMetrics Marketing Optimization Summit. You can follow him on Twitter or Google+.